Experience the Pacific Northwest at its best along the shores of the Wild and Scenic Rogue River. Your OARS hiking vacation covers up to 45 miles of trail along the Rogue River as it flows from its headwaters near Crater Lake National Park to the incomparable Oregon coastline. This uniquely active hiking departure includes all the beauty and comforts of a standard OARS trip on the Rogue, but gives you a new perspective, from above the river on the trail. Escorted by expert hiking guides, our guests carry only a small day pack, hiking from one riverside camp to the next. A delicious dinner with an eclectic selection of local wines greets you in the afternoon, and each night we’ll make camp on one of the many sandy beaches that line the river. Whether inside a tent or under the starry night sky, you’ll sleep soundly, serenaded by boisterous crickets and the rush of the passing river. We’ll meet at 6:00pm for a pre-trip meeting at the Galice Resort in Merlin, OR. The “resort” is an all in one gas station, small store, restaurant and lodge. An OARS guide will greet you on the front porch of the store/restaurant and direct you up the hill to the meeting location. If you somehow miss the OARS staff person, you can ask to be pointed in the right direction to the meeting at the counter inside the store. The pre-trip meeting is an opportunity to meet your fellow travelers and trip leader and ask any last-minute questions. Your trip leader will give you a thorough trip orientation and pass out waterproof river bags so that you can pack your belongings that evening. Your trip leader will also reconfirm the time to meet at Galice Resort the following morning to catch the transfer to the launch point. 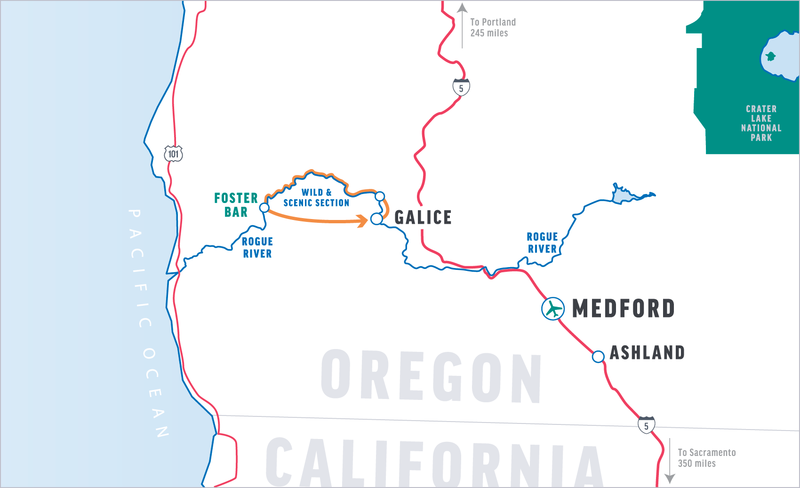 You will be transferred from Galice Resort to our starting point at Grave Creek trailhead on the Rogue River. The support rafts will be waiting for us there. We will pack our lunch, load our gear onto the boats, and talk about trail safety. We will cover the first five miles of the trail, which is quite rocky. We’ll pass by Rainie Falls, a narrow zone of extremely durable amphobolite, an erosion-resistant material which has created the unique rapid. We’ll stop to check out Whiskey Creek cabin. We’ll set up camp next to Tyee rapids on a sandy beach. While the guides prepare dinner, you’ll have time to explore the wooded terrain, take a swim or just relax with a good book. For the early risers in the group, hot coffee, tea and cocoa will be ready around 6:30 AM. A wake-up call comes shortly after, and breakfast is served. After you pack up your belongings, you’ll have some time to prepare your bagged lunch for the day while camp is broken down and the boats are loaded. We’ll hike nine miles with long, gradual climbs and steady descents. We’ll cross numerous creeks, including Russian Creek and Bronco Creek. Our breaks and lunch stops will usually be enjoyed alongside one of these beautiful creeks. We’ll make camp in the Horseshoe Bend/Meadow Creek area. We have 10 miles to cover on the mostly flat trail. We’ll pass by historic Battle Bar, named after a fight between Colonel Kelsey’s Calvary on the north bank and a band of Takelma Indians on the south bank. We’ll also pass Zane Grey’s. We’ll overnight at Mule Creek Camp, named in the summer of 1852 when a company of soldiers from Fort Orford tried to open a trail along the Rogue. A member of the party later related that a Lt. R.S. Williamson rode a mule named John. When the mule was turned loose to graze near the stream, it wandered off and was not found despite a thorough search. Because of this incident, the stream was named John Mule Creek, but later shortened to Mule Creek. The tale ended happily several years later when Williamson found his mule. We will have a well-deserved layover day around Mule Creek. We may hike up Mule Creek to visit a slot canyon and mining site. The terraces on both sides of the mouth of Mule Creek were seasonal Indian camps for over 8,000 years. A five-minute walk brings us to Rogue River Ranch. Once a major Rogue River Indian habitation site, the area has enjoyed a rich human history for over 9,000 years. We’ll visit the ranch museum to learn more about Native American and early white settlement in this area. Alternatively, you can get out your book, diary or sketchbook and spend some peaceful “alone-time” on the river bank. This is also a good time to fish, play cards or go for a swim. We’ll hike another 10 miles and enjoy some of the most dramatic views yet. The trail is relatively flat as we pass through Mule Creek Canyon. We’ll pause at Inspiration Point, overlooking Stair Creek Falls. The trail is on a narrow ledge high on the ridge. Occasionally, hikers with vertigo struggle with this section. (If this may be an issue for you, please contact us.) Below we can see deep, cool pools where salmon gather in the summer. We’ll pass Blossom Bar, named after the wild azaleas that bloom here. We’ll enjoy lunch at the picnic tables at Paradise Lodge. There will be a chance to purchase a cold drink or perhaps ice cream from the lodge store if you wish. After lunch, our trail leads us through the lovely Huggins Canyon and enchanted Brushy Bar. Another two miles brings us to Camp Tacoma, named after a mining operation from Tacoma, Washington. Leaving camp on the last day is bittersweet—we’re not quite ready for civilization again, but a hot shower sounds pretty nice. We have only six miles before we’ll reach the trail’s end. Keep your eyes peeled for the elusive bald eagles that inhabit this section of the river canyon. We’ll pass Flora Dell Creek with its punchbowl waterfall that plunges over a 30-foot sheer wall into a deep trailside pool. We’ll then stretch our legs with a few switchbacks up over a hill and back down again before reaching the end of the trail. We will meet our driver and be transported less than a mile to Foster Bar, where the rafts will be waiting with our personal gear. We’ll pack up the vans and then relax for the scenic, 2-3 hour mountain drive back to Galice Resort. You should arrive before 6:00 PM. Although the Rogue River Trail is only moderately strenuous overall; it is at times steep, rocky and narrow with exposed sections, and therefore it is not recommended for people who have a fear of heights or children under the age of 12 years. Please be prepared for full days of hiking, and be aware that gym workouts or flat land walking are generally easier than wilderness hiking. All meals from lunch on day 1 through lunch on the final day, with limited beer & wine at dinner. The day before your trip we will meet at 6:00 PM at Galice Resort, in Merlin, OR for a pre-trip meeting. Your trip leader will provide a thorough trip orientation and pass out your waterproof bags so that you can pack your belongings that evening. The trip leader will also reconfirm the time for meeting at Galice Resort the following morning and give you an opportunity to ask any last-minute questions. On the final day of your river adventure, you will return to Galice Resort at approximately 6:00 PM. After each active day on the trail, we will meet our gear boat at our camp for the evening. Upon arrival, individuals will collect their waterproof bags and locate an area on the beach to set up tents. The first night, a crew member will give a demonstration on setting up a tent, which you’ll see is quick and easy. The guides will set up the kitchen and central dining/seating area with camp chairs. They will also locate a secluded area away from camp to set up the portable toilet. As dinner is prepared by the guides, hors d’oeuvres will be served and you will have an opportunity to relax, enjoy a drink if you wish, and reflect on the day with your fellow traveling companions. In the morning, the first wake-up call will let you know that coffee, hot water for tea or cocoa, juice, fresh fruit and cold cereal are ready on the hors d’oeuvres table. You can fill your mug and grab a bite, then begin to pack up your personal belongings and sleep gear as the guides prepare a hot breakfast. After breakfast is served, we’ll pack lunches for the trail. Then, the entire camp will be broken down and packing will be completed. The gear will then be loaded onto the boats and we’ll continue our trek to see what new adventures await us. We provide plenty of water throughout the trip. When at camp, we provide one soda per person per day along with a limited supply of beer and wine. You are welcome to bring your own favorite beverages, alcoholic or non-alcoholic, in non-glass containers. If you choose to bring additional beverages, please let us know in advance. For your safety and the safety of others, alcoholic beverages are limited camp. Be prepared to hike between 5-10 miles each day, under varying trail conditions. Most of the Rogue River Trail is well constructed and has moderate grades. The group will hit the trail each morning after a hearty breakfast and a bottomless cup of coffee or tea. During the day, you will need to carry your lunch, drinking water, camera gear, and spare clothing such as rain gear or long underwear, depending on weather conditions. All other gear will be shuttled down river, from camp to camp, by OARS crew in our rafts. We have one guide designated as trail lead on smaller trips and, on larger trips, we have one guide designated as trail lead and also one guide designated as trail sweep. We strongly encourage you to be aerobically fit, have comfortable, broken-in hiking shoes with socks, and bring a good pack. The first five miles of day 1 on the Rogue River trail are quite rocky and require patience while you secure stable footing. Day 2 is a nine-mile hike involving long, gradual climbs and steady descents with numerous creek crossings. We will traverse a mostly flat, 10-mile trail on day 3. A well-deserved rest day comes on the fourth day. Day 5 involves another 10-mile hike with spectacular views of the river and a stop at Paradise Lodge. The last day of the journey involves a six mile hike and a shuttle back to Galice Resort. For those not wishing to hike the entire trail, riding along in the gear boat is a potential option for guests who much prefer the rafting portion of this trip. If you have a member of your group who is not an avid hiker, please let us know as soon as possible so we can accommodate. The Rogue River Trail has some thick sections of poison oak. If you are highly allergic, please plan to wear long pants for extra protection. Bring soap or Tecnu to wash away the plant’s poisonous oils that may be left on your skin or clothing from accidental contact with this plant. Depending on the spring weather and amount of trail maintenance that the BLM/FS has done, there may be sections of trail where contact with poison oak is unavoidable. Fishing licenses may be purchased online here: https://odfw.huntfishoregon.com/login or in-person at a licensed vendor. They are not available for purchase over the phone. Along the Rogue River Trail there are a few places that have public pit toilets available for use. We also carry a small container called the “day tripper,” which can be easily accessed during the day should the need arise. It is a personal disposable toilet, which includes an odor-proof transport bag, chemical solidifier and odor eliminator, toilet paper and an oversized hand wipe. While on the trail, you may wish to place your camera in a zip-lock plastic bag or waterproof casing for extra protection. We strongly recommend you take out a rider on your homeowner’s policy to cover your camera—especially if it’s fine equipment. Make sure to bring additional memory cards, batteries, and any other extras you will need. Disposable waterproof and panorama cameras are also a fun option. Once you are on the river, there is limited communication with the “outside world.” Cell phone service is not available. Our guides carry satellite phones which are strictly used to call out in case of an emergency situation on the river or trail. They can call out, but we cannot call them. The trip leader will periodically check in with our office. If someone needs to contact you about an emergency at home, they should call our office (800-346-6277). If possible, we will relay the message to you. Keep in mind it could be several days or longer before the message actually reaches you. For your family at home, you should define for them what you consider an emergency and provide them with instructions to call our office in the event one occurs during your vacation. During the day – Start with sunscreen, shorts or long pants (convertible pants are great), and long-sleeved shirt. Add additional layers of synthetic or merino wool long underwear, socks, rain pants and rain jacket depending on the time of year and weather. In the morning it can be cool. As the day warms up, layers can be taken off and stored in your day pack. In camp – After a long day on the trail you may want to refresh and change into clean, comfortable clothing. Soft, loose-fitting shorts or pants, t-shirts, etc., will allow you to truly relax in the evening. For spring and fall trips, you will want to have something dry and warm, such as long sleeved shirts, pants and fleece. During the day – Footwear will make or break your trip. For daily wear on the trail, you will want a sturdy pair of hiking shoes or boots with good support and soles. In camp – a second pair of shoes or sandals to change into at camp will give your feet a break from your trail shoes. As many hikers like to bathe at camp, consider river sandals as your camp shoes. Find professional-grade options made by Chaco®, the official footwear sponsor of OARS guides. Please note: If you plan to buy footwear for the trip, make sure you get it far enough in advance to break it in and wear your footwear until it’s comfy—if your feet hurt, you won’t enjoy the trip! During the day – Wide-brimmed hats or ball caps are a good choice for sun protection. Synthetic or merino wool long underwear is a must-have on trips. It can be worn under shorts, rain gear, T-shirts, etc., then stripped off when the chill of the morning has worn off. It keeps you warm even if it’s wet, dries quickly, and it’s compact enough to be stuffed into your day pack after you take it off. It can be layered under your waterproof rain jacket and pants. Be aware that cotton items, once wet, do not insulate; only synthetic and wool materials will keep you warm during cool, wet weather. You need to be prepared for inclement weather. Bring a good fleece or wool top and bottom, along with a warm hat and gloves. You’ll want to double up on your synthetic layers so that you’ll have a set to wear on the trail and a set of warm, dry clothes for camp. Raingear protects you from rain and wind. It is one of the essential items that all passengers should have no matter what time of year you are traveling. Look for jacket and pants that are 100% waterproof, not just water resistant. A hooded jacket is recommended, as well as good secure closures around your head, neck, wrists and ankles. Do not bring a rain poncho as it cannot be worn under your PFD (Personal Flotation Device) if you need to ride on the raft for any reason. At the pre-trip meeting, each person will be given two large waterproof bags (approximate sealed size: 25” tall x 13” diameter; 3318 cu in; 54.4 L). One bag will be for your clothing and personal items. The second bag will be for your sleeping gear (sleeping bag, sleeping pad, ground tarp, sheet and pillow). These two bags will essentially be your “checked luggage” and will only be accessible in camp. Tents are stowed separately. Please note: If you rent a sleep kit from us, it will come pre-packed in one of the two waterproof bags. This pre-packed bag will already be loaded onto a raft and will not be available to you at the time you are issued your second waterproof bag. When we leave Galice Resort, we head straight to the trailhead to begin our day’s hike. You will bring your daypack with you on the trail; your waterproof bag will be loaded directly onto a raft. Your personal, now mostly empty, luggage can be stowed in your vehicle for the remainder of the trip. Please pack light; river attire is very casual. Comfort, convenience and boat space takes precedence over style. At the end of the trip you will return to Galice Resort with your packed waterproof bags where you will be able to unpack your gear for your return trip home. O.A.R.S. West, Inc. and cooperating agencies act only in the capacity of agent for the participants in all matters relating to transportation and/or all other related travel services, and assume no responsibility however caused for injury, loss or damage to person or property in connection with any service, including but not limited to that resulting directly or indirectly from acts of God, detention, annoyance, delays and expenses arising from quarantine, strikes, theft, pilferage, force majeure, failure of any means of conveyance to arrive or depart as scheduled, civil disturbances, government restrictions or regulations, and discrepancies or change in transit over which it has no control. Reasonable changes in itinerary may be made where deemed advisable for the comfort and well being of the participants, including cancellation due to water fluctuation, insufficient bookings (this trip requires a minimum of 4 people), and other factors. There is risk in whitewater rafting, particularly during high-water conditions. Rafts, dories and kayaks do capsize. You could be swept overboard. Your guide will make every attempt to assist, but you must be strong and agile enough to “self-help” and “float-it-out” without further endangering yourself or others. We reserve the right not to accept passengers weighing more than 260 pounds or with a waist/chest size exceeding 56 inches. We may decide, at any time, to exclude any person or group for any reason we feel is related to the safety of our trips. We are experienced at accommodating people with various disabilities. Please give us an opportunity to make you feel welcome. We need to discuss any special requirements ahead of time. On advancement of deposit the depositor agrees to be bound by the above recited terms and conditions. Prices subject to change without notice.